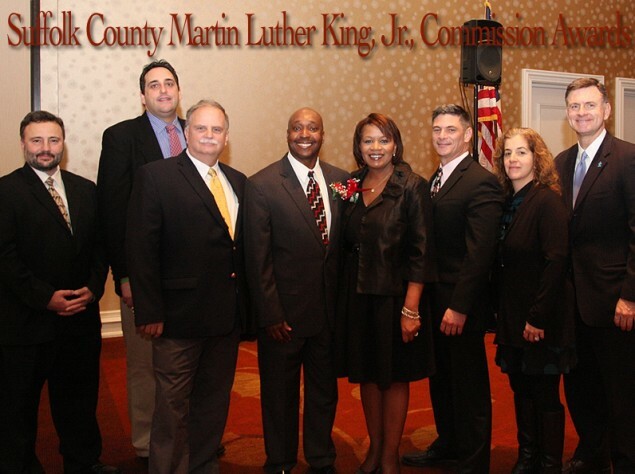 South Huntington Deputy Superintendent Ms. Jacci Harris and South Huntington 2013 Teacher of the Year Mr. Rufus Shepard were honorees at the Suffolk County Martin Luther King, Jr., Commission annual awards luncheon, held on Friday, January 16. The luncheon also featured the Central Islip High School Concert Choir. The Honorable Steve Bellone, Suffolk County Executive, spoke of the commitment to Dr. King’s dream, and keynote speaker Dr. Cynthia Diaz, a successful lawyer and judge who left the corporate world to enter the ministry, encouraged the audience to be passionate about learning and sharing new areas of growth and positive development in their communities. Photo: Left to right: Dr. Joseph Centamore, NYS Assemblyman Chad Lupinacci, Jim Kaden, honorees Rufus Shepard and Jacci Harris, Dr. Dave Bennardo, Lisa Brieff, and Ed Nitkewicz.